Here, we bring to you a few episodes of the TV Program ‘Swayam Se Saksatkar’ broadcast on Aastha Channel every Sunday at 6:50 pm. In this program Prajnanpurush Sri Sri Babathakur’s Divine Teachings are presented in Hindi, elaborating in brief, the highlights from His video discourses. Attempts are made to cover one particular spiritual topic in each episode so that the seekers and viewers can assimilate the Master’s teachings in easy steps. Click on the links embedded in the icons/headings below to view the particular episode. 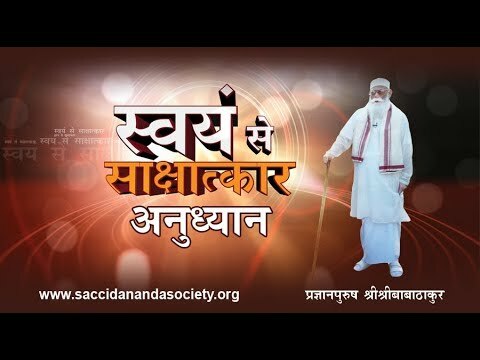 Saccidananda Society presents Swayam Se Sakshatkar on Aastha TV Channel. The show started from 17.02.2013 at 7:10 pm on every Sunday. Recently the timing of the program has changed to 6.50 pm on every Sunday. This video is the first part of the Episode 1. This program is based on the spontaneous deliberations of the ultimate Truth revealed to Prajnanpurush Sri Sri Babathakur, a perfect Self-Realizer. This video is the second part of the Episode 1. This program is based on the spontaneous deliberations of the ultimate Truth revealed to Prajnanpurush Sri Sri Babathakur, a perfect Self-Realizer. He used to have spiritual trances (Samadhi) quite often. Just before and after such trance state of devotional Bhajans and spiritual discourses, based on Non-dual principle, used to reveal with spontaneity and incessantly, listening to which the seekers used to feel the awakening of divine experiences within. This motivated them to realize their true identity in other words to have ‘Swyam Se Sakshatkar’. Just before or immediately after deep Trance or Samadhi, Divine Songs or Bhajans used to get revealed spontaneously to the All Divine Master Sri Sri Babathakur. The Divine songs or Bhajans revealed to Him when listened by an aspirant seeker of truth used to pave the way to regain their true identity which is somehow or other lost. The Master used to say that these Bhajans are the formula for realization of ultimate truth. Many of such Bhajans were recorded and books, CDs were published. The Master used to teach such Divine songs to the devotees. These Bhajans are also a part of the program. The name of the program is ‘Swayam Se Sakshatkar’, a Hindi text meaning encounter with the Self or Self-Realization. The term Self-Realization is widely used in throughout ages, but seldom we find a person of that Realization. In one sense, the Self and Its Realization ever awaits for us. Sri Sri Babathakur says that everyone has the birth-right to know the Real Nature or Real Identity of us. We are not born just to enjoy and suffer but to realize our own Self which is ‘All Divine for All Time, as It Is’. Knowing Which there remains nothing more to be known or sought for. The program ‘Swayam Se Sakshatkar’ is a window of opportunity for all of us to get aligned to our beloved Self. There are two distinctly different world that exists in and around us— the world of mine and the world of ‘I’. The world of mine or its experiences can only manifest and sustain with the constant presence of ‘I’ or the Self as the background. But the world of the Self or ‘I’ or ‘I-Reality’ exists spontaneously on Its own. It is self-begotten self-effulgent and self-existing. The Master says, to give more importance to the world of the mind/mine is the first mistake that one makes. This first mistake has to be rectified first.